Upon entering Ellen Hyllemose’s exhibition, we are met by a bulky load formed of three large bundles of fabric stuffed with ordinary DIY materials (Reconfiguring Landscape (floor piece), 2015). Fragments of cardboard or bubble wrap are discernible under the soft Lycra, and their shapes and surfaces poke out gently to reveal different textures and forms that seem at once chaotic and carefully modelled. Inserted between the bundles, small layers of dyed concrete and string stick out, creating a small yet potent focus of colour within the predominantly white surface of the fabric. This large sculptural work doesn’t exactly obstruct the passage into the main space, although its sheer physical presence – it almost touches the ceiling – makes us instinctively divert our route a little too close to the gallery walls. Another large-scale work dominates FOLD’s long and somewhat narrow gallery. 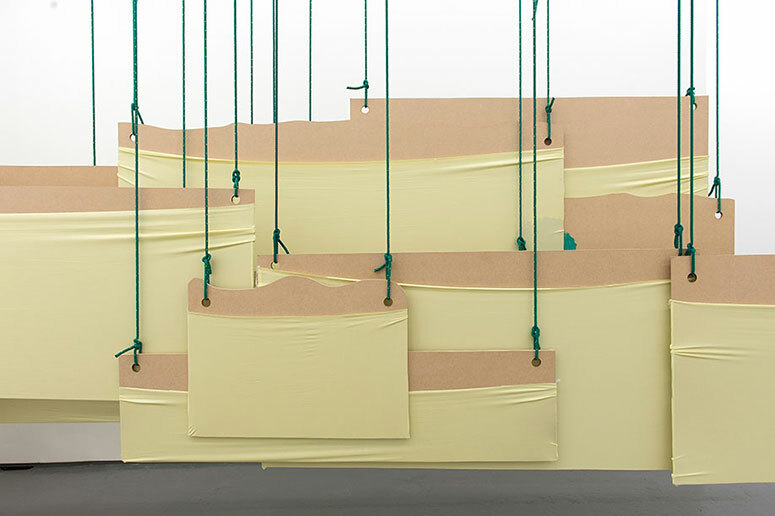 Running parallel to the full length of the wall, a ‘hanging painting’ is formed by roughly cut MDF panels partly covered with pale yellow fabric, suspended from the ceiling by forest-green ropes (Reconfiguring Landscape (double hanging piece), 2015). These panels come in slightly variable sizes and shapes and hang layered over each other at different heights, but always very close to the floor. The entire room is taken over by the sequence of vertical green lines combined with the horizontal rhythm of the superimposed brown boards traversed by yellow swathes of stretched fabric. Using only ordinary materials in a very different way, Hyllemose manages to create a sense of expansiveness in a space that, it seems to me, would normally feel quite confined. Instead of attempting to disguise the architectural limitations of the gallery, she has opted to underscore them with this bold yet elegant installation that requires us to move along its length in order to fully apprehend it. Landscape Reconfigured also features a series of more modest wall pieces in which the artist continues to explore the inherent qualities of materials (Glue Between Landscapes, 2014-15). One small work consists of a board covered with several layers of stretched Lycra that have been imprecisely cut to reveal sections of contrasting colour around the exposed surface of the background. As in her fabric bundles, the materiality of what is hidden behind other layers remains visible, even if subtly. In other cases, Hyllemose applies the paint directly on unprimed MDF, creating bright colour-fields that only partially cover the raw wood. Finally, there is a group of works made of clusters of cut-up strings of painted paper that hang from a nail inside frames (Reconfiguring Landscape (framed), 2015). This is perhaps a necessary conservation compromise, but when contained within boxes her work seems to lack the straightforwardness that characterises the other works in the show. In her best pieces, Hyllemose’s everyday materials are reconfigured into compositions that deftly emphasise not only their textures and colours, but also the space that surrounds them.